The late Grammy-winning founder of the legendary pop/R&B/soul/funk/disco group tells his story and charts the rise of his legendary band in this sincere memoir that captures the heart and soul of an artist whose groundbreaking sound continues to influence music today. With its dynamic horns, contrasting vocals, and vivid stage shows, Earth, Wind & Fire was one of the most popular acts of the late twentieth century—the band "that changed the sound of black pop" (Rolling Stone)—and its music continues to inspire modern artists including Usher, Jay-Z, Cee-Lo Green, and Outkast. At last, the band’s founder, Maurice White, shares the story of his success. White reflects on the great blessings music has brought to his life and the struggles he’s endured: his mother leaving him behind in Memphis when he was four; learning to play the drums with Booker T. Jones; moving to Chicago at eighteen and later Los Angeles after leaving the Ramsey Lewis Trio; forming EWF, only to have the original group fall apart; working with Barbra Streisand and Neil Diamond; his diagnosis of Parkinson’s; and his final public performance with the group at the 2006 Grammy Awards. Through it all, White credits his faith for his amazing success and guidance in overcoming his many challenges. 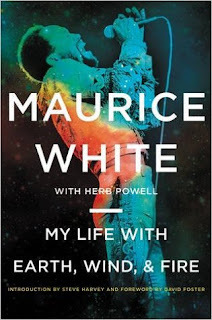 My Life with Earth Wind, and Fire is an intimate, moving, and beautiful memoir from a man whose creativity and determination carried him to great success, and whose faith enabled him to savor every moment. Maurice White: My Life with Earth, Wind and Fire is a 2016 Amistad publication. To be completely honest, I have no recollection of checking this book out of the library. I got a notification from my Overdrive library letting me know a book I had on hold was ready to be downloaded. To my surprise, this book, along with the one I had been expecting, was sitting in my queue. I almost returned it, but then decided it might be a good choice for my ‘Monday Musical Moments’ feature on my blog. I’m very glad I decided to go ahead with this book, even if I had to work it into my tight reading schedule. In the beginning, the writing was a little rough, mainly because I felt like things were moving along at a breakneck speed, which left little room for an intimate look at Maurice, his music, his relationships, and so on. However, as the book progressed, the frenetic pacing did slow down a little and a rhythm developed. The more I discovered about Maurice, the more I started to like him. He was a smart, well read man, very spiritual, with an open mind, and was refreshingly honest about the way he lived his life. Despite his having glossed over large chunks of time, I could relate to White’s introverted nature, and could understand his mindset, and picked up on how uncomfortable he felt about divulging personal aspects his life. I always liked EW&F, but was more of a casual fan. While Maurice may have been the founder of the group, the person I always associated it with was Phillip Bailey. However, this book did remind me of just how many hits the group had, how influential they were, and what a huge impact they had on fans during some very turbulent times. Earth, Wind & Fire has been around for many years, and even today, they made an appearance on the 2018 Rose Bowl Parade, and I’ve had ‘September' in my head ever since. But, while the band is still out there doing their thing, sadly Maurice is no longer with us. His death, from Parkinson’s Disease in 2016, gives this book, which is a memoir/autobiography, a haunting tone. Overall, it is too bad the book wasn’t fleshed out just a bit more, but I still found it enlightening, interesting, and of course poignant. 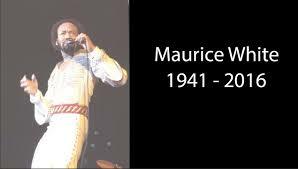 Maurice White was an American singer-songwriter, musician, record producer, arranger and bandleader. 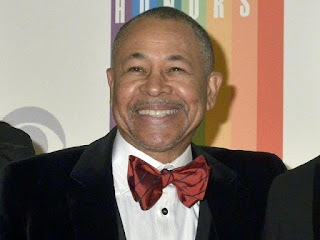 He is the founder of the band Earth, Wind & Fire. 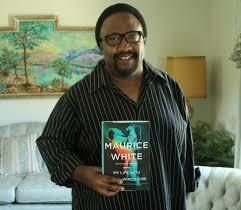 White served as the band's main songwriter and record producer, and was co-lead singer along with Philip Bailey. Earth, Wind & Fire was famous for spanning the musical genres of R&B, soul, funk, jazz, disco, pop, rock, and more. White won seven Grammys, and was nominated for 21 Grammys in total. He was inducted into the Rock and Roll Hall of Fame as a member of Earth, Wind & Fire in 2000. HAPPY NEW YEAR- 2018 -FROM THE BOOK REVIEW! !